Mo'ne Davis knows "haters are gonna hate," but she’s too cool to let it get to her. The 13-year-old Little League World Series star proved once again how awesome she is by reaching out to the president of Bloomsburg University to ask him to consider reinstating the baseball player who insulted her on Twitter, TMZ Sports reports. Casselberry is a native of Eagleville, Montgomery County, and a former baseball player at Methacton High School. TMZ Sports spoke with a representative for Bloomsburg and reported that President David L. Soltz received an email from Davis and her coach asking that Joey Casselberry's dismissal from the team be reconsidered, but as of now the school is standing by its decision adding that the athletic department's social media policy – and possibly the school's code of conduct – forbids such actions. 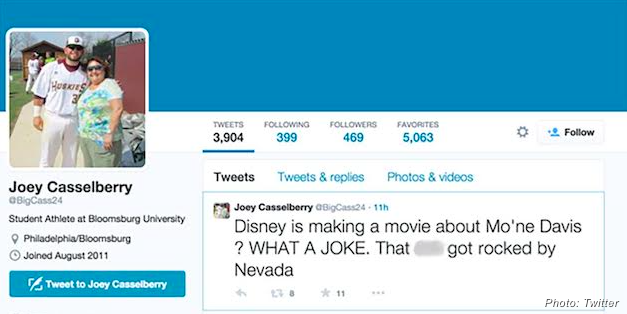 Casselberry has since apologized for the tweet and says he's a huge Mo'ne Davis fan. Read the full TMZ Sports article here.